To evaluate the effects of cyclosporine treatment in naturally occurring atopic dermatitis (eczema or skin disease) in dogs. Cyclosporine is an approved and commonly used drug for this disease, and the proposed study will evaluate immune (reaction and interaction of drugs with the body) and pharmacologic (actions of the drug) responses to the drug to help understand why some dogs respond more strongly than others to the medication. 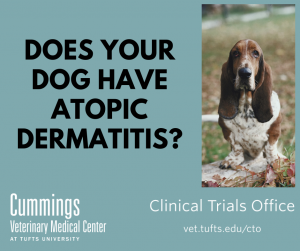 Dogs must be diagnosed by the dermatology service with atopic dermatitis, and must be recommended to receive cyclosporine therapy for at least 30 days. Long-term cyclosporine administration is one treatment option for atopic dermatitis that is considered standard of care. Patients cannot have been treated with oral/topical steroids or oclacitinib (Apoquel) within the past 2 weeks, or long-acting steroid injections within the past 6 weeks. As part of the study, you will receive a free 1 month recheck with our dermatology service. Cost of the blood draw will also be covered by the study. Participation in the study will be incentivized by offering $100 towards the purchase of cyclosporine.